As of August 28, 2017 financial based organizations in New York must be in compliant with many aspects of NYCRR Part 500. With further advanced adoption through 2019. Organizations need help in understanding and meeting these requirements. NYCRR Part 500 is the first ever state mandated cybersecurity policy. With large scale breaches becoming a re-occuring theme, the state of New York felt compelled to protect its businesses and their customers. 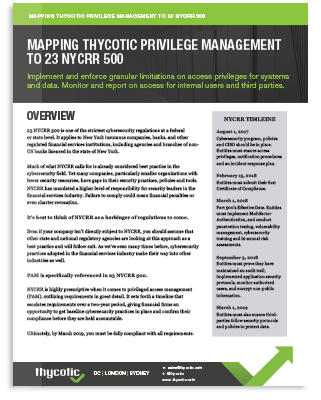 Thycotic delivers a comprehensive privilege security solution to help organizations discover, protect, control, and manage privileged accounts and the access they provide. As of August 28, 2017 the first set of compliance requirements must be followed. March 1, 2018 Compliance with sections 500.04(b), 500.05, 500.09, 500.12 and 500.14(b) is due.